Let's see the 5 steps to create the first spring application. 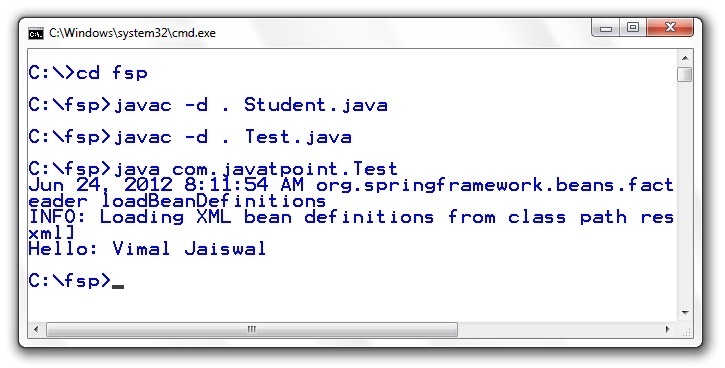 This is the simple java bean class containing the name property only. This is simple bean class, containing only one property name with its getters and setters method. This class contains one extra method named displayInfo() that prints the student name by the hello message. The bean element is used to define the bean for the given class. The property subelement of bean specifies the property of the Student class named name. The value specified in the property element will be set in the Student class object by the IOC container. Create the java class e.g. Test. Here we are getting the object of Student class from the IOC container using the getBean() method of BeanFactory. Let's see the code of test class. The Resource object represents the information of applicationContext.xml file. The Resource is the interface and the ClassPathResource is the implementation class of the Reource interface. The BeanFactory is responsible to return the bean. The XmlBeanFactory is the implementation class of the BeanFactory. There are many methods in the BeanFactory interface. One method is getBean(), which returns the object of the associated class. There are mainly three jar files required to run this application. For the future use, You can download the required jar files for spring core application. download the all jar files for spring including core, web, aop, mvc, j2ee, remoting, oxm, jdbc, orm etc. To run this example, you need to load only spring core jar files. Now run the Test class. You will get the output Hello: Vimal Jaiswal.